Self-tanners are both exciting and terrifying– thats how I feel when I’ve ponied up the energy to use them. I’m pumped that I might glow and simultaneously terrified I’m going to be orange. Its a fine line that I seem to enjoy walking every time the temperature rises. I love tan towels, they are my standby and they are genius, easy to use, idiot proof and leave you golden in the truest sense of the word. They work. But they are NOT green. 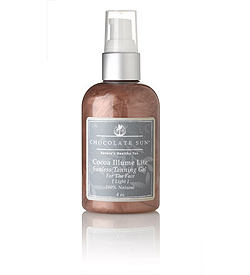 So when I was looking for alternatives I went for Chocolate Sun’s Cocoa Illume Lite Sunless Tanning Gel for Face in Light and I also got one for the body, namely for my legs. I bought these guys in the middle of winter knowing once it got warm it would be sold out, I was right and very happy I was prepared like a Girl Scout for summer’s limb show. You should know I don’t tan my face, I wear SPF everyday and at the beach I rock a huge mom hat. So my face in the summer is markedly lighter than the rest of my body– not only is it noticeable it also looks odd. I do this because I don’t want wrinkles. My parents who never wear body sunscreen always have worn gobs, piles and layers of sunscreen on their faces and while they have expression lines, they both really lack those fine sun lines and sun damage in general. Self- tanner fills in the gap for me and my paleness. So last week, I busted out the self-tanner for face and went to town with three small pumps into my palm for three consecutive days. For the face the application is idiot proof, just be sure to rub it in, otherwise I did nothing special at all in preparation for the application. A day later, I had sort of forgotten that I had self-tanned until I was checking myself out in the mirror and remarked to myself how glow-y I looked. I looked really healthy, I looked like I was at the beach or at least that I was a mildly active adult who runs outside. I was not at the beach and I avoid running outside, it was then that I remembered I self-tanned. Damn. This stuff seriously works and even fooled me, despite the fact that I was the one who used it. The one for the body is equally good, its darker than the one for face and leaves you super golden–not orange at all. You have to follow all the rules for self-tanner usage namely, exfoliation (without oil based products) prior to application as well as moisturizer before. But if you follow these steps the application is pretty easy, non streaky and the results are really natural. Finally, all natural self-tanner. While I won’t give up my tan towels for travel, laziness, or for when self-tanner anxiety creeps up these two self-tanners by Chocolate Sun are a great alternative. Just thinking about self-tanners on my way home from work today (must be the FINALLY warm weather). Thanks!